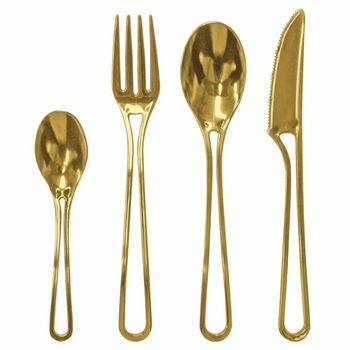 When you're sitting down for a Thanksgiving feast or preparing for your big wedding day, let Modern Design Gold Plastic Cutlery give you the elegant look you deserve. The gold silverware look like the real thing, but when your finished, they go in the trash. There's no late night dish washing when you have plastic silverware. You can enjoy your holiday dinner or special event confident that when it's over, you can throw everything in the trash and not worry about it anymore. It's the perfect choice for anyone that wants the look of fine China, but doesn't want to deal with the mess. Modern Design Plastic Gold Forks 20ct. Modern Design Plastic Gold Knives 20ct. Modern Design Plastic Gold Teaspoons 20ct. Modern Design Plastic Gold Soup Spoons 20ct.